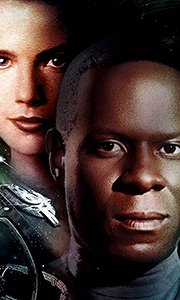 Episodes Emissary: 46379.1 Commander Sisko's Starfleet crew occupies the space station Deep Space 9, provoking a hostile Cardassian reaction. Past Prologue: Stardate Unknown Former Bajoran terrorist Tahna Los seeks help from station officer Kira Nerys. Two notorious Klingons appear. A Man Alone: 46421.5 When one of Security Chief Odo's former detainees is found slaughtered, an angry mob demands justice. Babel: 46423.7 Kira uses he..
Episodes The Search, Part I: 48213.1 Sisko's team depart for the Gamma Quadrant in a heavily armed experimental starship, the USS Defiant. The Search, Part II: 48213.1 Odo is enticed by a female shapeshifter while Kira makes a discovery which clarifies a great deal. The House Of Quark: Stardate Unknown To avoid dishonouring her dead husband, a Klingon widow forces Quark to become head of her house. Equilibrium: Stardate Unknown Po..
Own Star Trek - Deep Space Nine Seasons 1 to 7 Complete Collection DVD from Deff, DVD, Blu-Ray & 4K Video Specialists - Free UK Delivery..
Episodes The Homecoming: Stardate Unknown Kira Nerys “borrow” a Starship to rescue Bajor's greatest resistance leader from a labour camp. The Circle: Stardate Unknown While Kira is kidnapped and beaten, Odo discovers the real perpetrators of the planned coup. The Siege: Stardate Unknown Arriving to find a deserted station, Bajoran troops begin a deadly hunt for concealed Starfleet saboteurs. Invasive Procedure: 47182.1 Klingon mer..
Episodes The Way Of The Warrior, Parts I & II: 49011.4, Distrusting the Cardassians, the Klingon Empire dispatch a taskforce to DS9. To help handle the Klingon troops, Sisko enlists Klingon Officer, Lt Commander Worf. Together they try to avert a Klingon assault on Cardassia. The Visitor: Stardate Unknown An aged Jake Sisko realises he may have a way to prevent the death of his father. Hippocratic Oath: 49066.5 Held prisoner, Bashir..
Own Star Trek - Deep Space Nine Season 5 DVD from Deff, DVD, Blu-Ray & 4K Video Specialists - Free UK Delivery..
Episodes A Time To Stand: Stardate Unknown In command of a Jem'Hadar attack ship, Sisko's crew finds itself under fire from the starfleet vessel. Rocks And Shoals: Stardate Unknown Sisko's team is captured by a Vorta with insufficient drugs to keep his troops under control. Sons And Daughters: Stardate Unknown Worf regrets his attempts to toughen up his son when Alexander accepts a potentially lethal mission. Behind The Lines: 511..
Episodes Image In The Sand: Stardate Unknown Back on Earth, Sisko is stabbed, and stays long enough to encounter an old friend. Shadows And Symbols: 52152.6 While Kira sets up a blockade against the Romulans, Sisko searches for a lost Orb. Afterimage: Arriving On DS9 Ezri Dax must deal with the range of reactions her presence generates. Take Me Out To The Holosuite: Stardate Unknown Sisko's adversary, Vulcan Captain Solok, arrives..